A master chef’s surprising secret for keeping day-old bread from going to waste. It turns out pesto is a lot more versatile than we thought. 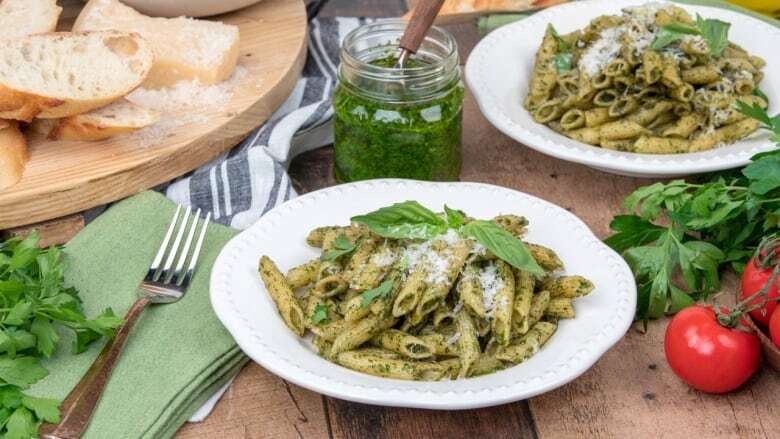 This version from renowned chef, Massimo Bottura uses mint and bread to make a standout sauce for the next time you’re craving a big bowl of pasta — no pine nuts needed! He stopped by The Goods to talk with Chef Shahir about his dedication to reducing food waste, and shared this recipe from his new cookbook Bread is Gold. It’s simple, unexpected, and it repurposes the ingredient he is most passionate about, stale bread! In a blender or food processor, combine the basil, parsley, mint, breadcrumbs, garlic and 5 ice cubes and pulse until finely chopped. Add the olive oil, Parmigiano and salt and pulse to incorporate. Bring a large pot of lightly salted water to a boil over medium heat. Add the fusilli and cook until al dente. Toss the pasta with the pesto. Sprinkle with the grated Parmigiano and serve. Excerpted from Bread is Gold. Copyright © 2017 by Massimo Bottura. Published by Phaidon. Reproduced by arrangement with the Publisher. All rights reserved.